Former Mumbai MP Priya Dutt will contest the General Elections 2019. 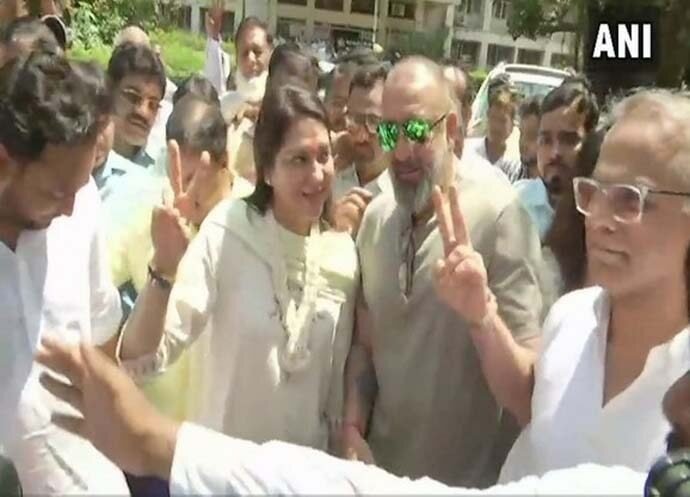 Speaking with Rohit E David, Dutt explained her return to politics, the Congress' chances in Maharashtra, roping in Raj Thackeray and her brother Sanjay Dutt. Q. Maharashtra was once a Congress stronghold — how do you realistically see the situation now? We have a very good chance — we hope to bring back its stronghold position as it was. We had a five year break and people have come to realise and see the difference between what it was and what has happened. So, I feel that they have realised — and they will definitely vote us back. Q. What is the big issue this election? I feel it's more about jobs, farmers' distress and the economy which is affecting the common person. People are looking at their lives and how this government has affected it. Q. You had yourself stepped aside from politics — what brought you back? Seeing what the scenario had become in this country. It was a fight which we all had to fight. Everybody has moved on beyond politics, they are fighting for the good of the nation. No one influenced me to come back into politics again. There was pressure though. There were people in my constituency, the party, workers, a lot of pressure and it was on for quite some time. I had stuck to my guns, but it took me a while to take a firm decision on what I should do. I realised that people like us have to give it a shot and do our bit to make a difference. Q. Speaking of taking one's time, do you think Priyanka Gandhi’s entry into politics has been blunted? Why would it be blunted? It was her decision to step into politics. In a situation like this, every like-minded person has come in and they want to do something to give back — she's come at a time when the country needed every single person. Q. But hasn't in fact Balakot even further blunted the Congress’ appeal now? No, it hasn’t. The Congress never brings in the army or armed forces into a political battle. It’s not that the Congress has not done strikes in its time but it has never brought that into a political arena. We should keep that aside. In fact, what happened in Pulwama was a terrible thing under this government — and yes, there are many questions being asked of security lapses. So, what we did in Balakot was an action which had to be taken — and we all stood by that action. Our stand on AFSPA, I feel, is misinterpretated — nobody is saying that we are doing away with it. What we said was that, we will review it so that it strengthens our armed forces as well takes into consideration the human rights angle. Q. The Congress wants the Maharashtra Navnirman Sena (MNS) President Raj Thackeray to give an extra punch in its rallies. Can you tell us about that? It is very clear that the MNS will support the Congress in this election. Q. But hasn't the BJP-Shiv Sena alliance actually hampered the Congress' chances in Maharashtra? People have realised that they have been appeasing each other throughout these five years. There is disrespect shown towards the Shiv Sena which has been seen by many over the years. I don’t think their workers have in fact come together. Q. So how is the Congress is trying to win back its votes from the BJP and Shiv Sena? The Congress has been going to the people and showing them what the truth is in the last five years. People do realise and see it for themselves. What we need to do is to tell them what the Congress has done. Q. In Mumbai though, do you see two rival Congress groups, headed by Milind Deora and Sanjay Nirupam? I don’t think there are any groups anymore — everything has been sorted out. There have been misunderstandings, people have raised their issues and I feel that’s what democracy in a party is all about. Milind Deora is a good face for a city like Mumbai, he has appeal in all classes, it’s a wonderful decision. Everyone is happy and content. Sanjay Nirupam is fighting from the seat he always wanted to. He was a good president, especially when the Congress party was at its lowest. He worked very hard to keep the Congress alive at that time. Q. How would you rate Hema Malini as a politician? I wouldn’t like to comment on her, she has been in politics for a long time. I am no one to evaluate Hema ji at all. Q. Your father, a famous film star, was a renowned social worker too. Nowadays, we see politicians appearing only when there is an election. Then they're seen on TV. Why did the spirit of community work vanish from our netas? I agree — people have lost that human connect. Everything is about television interviews and social media. But they can’t help it either, people have started believing everything which comes on TV or social media. I guess they have taken this opportunity and realised that this is the best way they should work. But I personally don’t think this is so because till the time you don’t have the human connect, there is no way people will bring you back into power. Q. Meanwhile, your brother Sanjay Dutt, with whom there's been some friction before, was with you when you filed your nomination — is he going to campaign for you? Yes — of course he will.